Charter bus rental service from Legend is nationwide. When transporting a large group of people our 50 or 55 passenger charter buses will do it without the hassle of carpooling or public transportation. 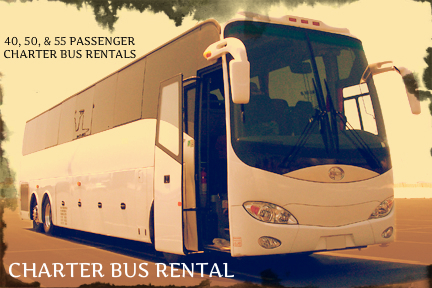 Mini coach and charter bus rentals are comfortable and safe. Plan a bus charter tour with alternate routes through scenic areas with any one of our experienced drivers. Charters are also ideal for long-distance trips for large groups travelling at a fraction of the cost of flying. We offer top-notch service for groups of all sizes. Our large executive buses ranging in size from a 40 passenger charter bus rental to 80 passenger charter bus rentals. Give your group everything needed for a comfortable long distance trip with Legend.